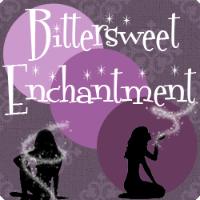 Bittersweet Enchantment: The Doomsday Kids Series & Survival Bottle Giveaway! 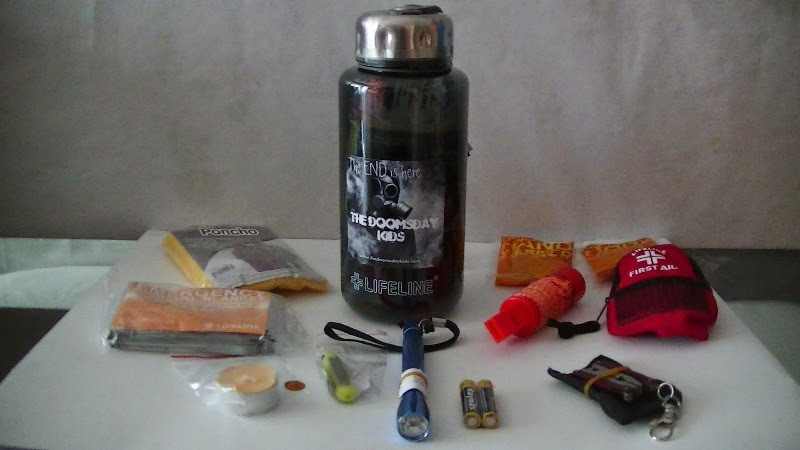 The Doomsday Kids Series & Survival Bottle Giveaway! Today I have a really amazing giveaway for you all! Karyn Langhorne Folan is the author of a NEW Post-Apocalyptic Series called The Doomsday Kids. The series follows a group of young adults who work together to survive a nuclear attack which has brought upon the end of the world. Each book focuses on one of the kids and their story. I have heard nothing but wonderful things about this series and in fact I will be reviewing book 1, Liam's Promise soon. 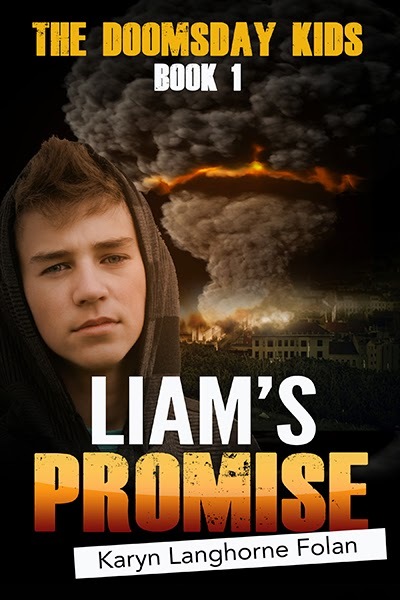 Paperback copies of Liam’s Promise, Nester’s Mistake and Amaranth’s Return, and a signed copy of new release Amy’s Promise and the winner will receive a Doomsday Kids “The End is Near” survival bottle! It’s everything you need for short-term survival in one convenient bottle that you can clip to a purse or backpack. With those last words from his mother, fifteen year old Liam Harper and his ten year old sister, Lilly embark on a perilous journey of survival. The bombs are coming any minute and after they fall, Washington DC will be gone. With only minutes to escape, Liam and Lilly and six other kids—some friends, some foes and all from wildly different backgrounds—embark on a desperate mission to survive first the blast and then the terrifying days ahead in the ruins of the world they once knew. In the wreckage of their community, without food or transportation, their only hope of safety is to walk to a mountain cabin almost two hundred miles away. If they can get to the Mountain Place, they hope to be reunited with Liam’s father, a decorated military veteran and survivalist who will protect and shelter them. But the journey brings Liam and his friends face to face with death and danger, deprivation and disease and worst of all: the realization that life will never be the same again. After their perilous escape from the wreckage of Washington, DC the surviving kids reach the Mountain Place, only to find their troubles have just begun. Fifteen-year-old Nester Bartlett’s biggest worries had been growing up black in America… until a nuclear apocalypse changed all of the rules he lived by. Now, instead of getting good grades and struggling against the negative stereotypes against African American men, he’s fighting just to stay alive. A 21st century nerd who excelled at robotics and science, Nester finds himself thrown into a lifestyle his great-great grandfather might have understood— tending animals, maintaining fires and guarding their safe house from intruders. 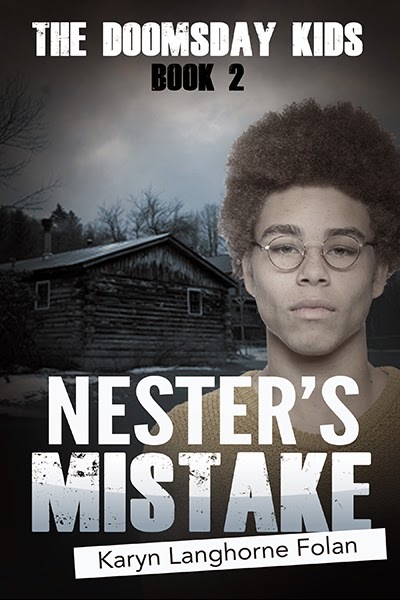 Angry, confused and grieving, Nester must find a way to put aside his feelings to care for the other Doomsday Kids, most of whom are too sick or traumatized to care for themselves. Then, as nuclear winter sweeps over them killing crops and animals, a medical emergency forces Nester to make a heartbreaking choice that shatters their little community and alters their hopes for survival forever. Dying of radiation poisoning, Rod Wasserman has one last wish: to return to the Wasteland of Washington DC to see if there’s any hope that his mother has survived the nuclear blast. Amaranth Jones has a last wish, too: for the chance to redeem herself. In order to do it, she must leave Liam Harper and her friends at the Mountain Place behind. So when she discovers Rod packing to leave, she insists on joining him— whether he wants her company or not. On their perilous adventure back to ground zero, the two teens confront the horrors of their post-apocalyptic world. Food and water are scarce, human life has little meaning and some desperate survivors have surrendered to the ultimate inhumanity: cannibalism. Threatened by weather, other survivors and their own demons, Amaranth and Rod must put aside their rocky history or they will die. But as Rod grows weaker, Amaranth confronts her darkest memories. How far will she go to help Rod achieve his last wish? And if they find Rod’s mother, can the three of them make it back to the Mountain Place alive? When a fresh catastrophe destroys the Mountain Place’s supplies, the kids have little choice but to leave, seeking out a Survivors Camp on the Gulf of Mexico eight hundred miles away. When their transportation fails, they will have to walk. Starvation and dehydration are their constant companions, and the physical limitations of the weakest of their number add difficulty to their journey. 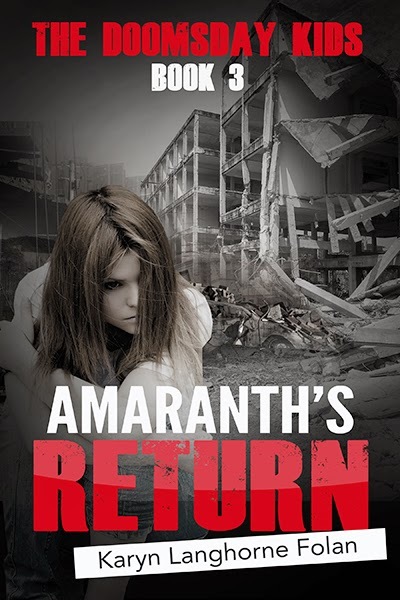 While scavenging the remains of the cities and towns not destroyed by the bombs, they’ll reunite with unexpected characters from their past and discover that the apocalypse has created all kinds of strange dystopian communities. Some are dangerous and some are benign—but all threaten group’s effort to reach their destination. When Amy reveals her deepest secret, she sets off a chain-reaction that will either be the kids’ greatest hope… or will cause them to go their separate ways. 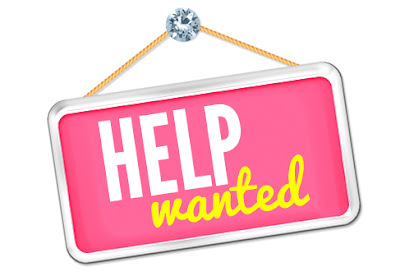 Please use the form below to enter. Giveaway is open to US only. 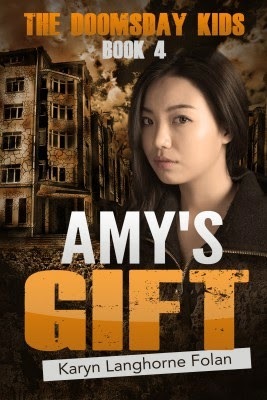 PRIZES: Paperback copies of all four the books in the series, with the latest book, Amy's Gift (SIGNED) and a survival bottle (image seen above)! Karyn Langhorne Folan graduated from Harvard Law School and after practicing and teaching law for several years, decided to pursue her dream of becoming a writer. 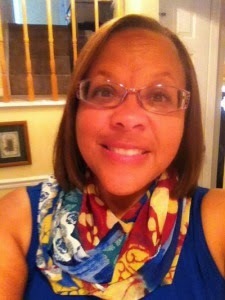 She is the author of twenty-one books and counting, including three young adult titles for the popular Bluford High series, four romance novels, several works of nonfiction. She has also been the ghostwriter for personalities in the entertainment and music industries. 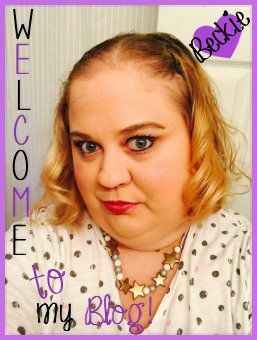 She is married and has two daughters. Wow, I love Doomsday things, I totally believe you need to be prepared in some way! This is an awesome giveaway, thank you! If were being logical and the world were to end today and I survived that part, I would definitely want my bug out bag! There's a weeks supply of basic needs, food and water for four people in there. If I wasn't being logical I would want my tablet with all my books on it lol. Good question, Beckie! I'd grab my survival kit. I put it together for hurricanes and the possible zombie apocalypse! A usable toilet is necessary for any incident affecting us. I have a bag I put together after the last earthquake, it isn't specific for survival after an apocalypse, but I think it would do!